St. Francis urged his followers to foster a “spirit of prayer and devotion” as a top priority in the Gospel life he proposed. 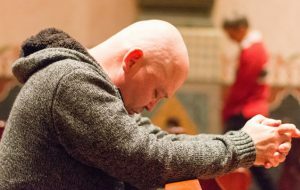 Our prayer life as Franciscans is witnessed communally, individually, and in the creative balance between the "contemplative" and "active" life. St. Francis of Assisi, with one or more brothers, celebrated the Liturgy of the Hours each day. Today the friars still gather for morning and evening prayer. We join our prayers with the daily prayer of the Church, sanctifying the day and evening hours with prayer. Whenever possible, St. Francis of Assisi and his brothers would participate in the celebration of the Eucharist. Today friars gather daily for the celebration of the Eucharist, sometimes with parish communities, at other times as a friar community, often in a friary chapel. St. Francis would frequently pray alone during the night, seeking out quiet places. Caves located in the hills above Assisi were a favorite place for Francis and to this day are frequented by pilgrims seeking Francis’s way of prayer. Today friars practice many forms of contemplative and meditative prayer, with Lectio Divina - the prayerful reading of the Word of God - holding a special place in our Franciscan tradition. The Virgin Mary features prominently in Franciscan prayer as well, as do traditional devotions, such as the Stations of the Cross and Eucharistic adoration. St. Francis once asked Brother Sylvester and Lady Clare to pray that he might know which way to choose: the contemplative or the active life. The answer from both was the more difficult challenge: to continue in active ministry, while remaining faithful to his call to a contemplative life. Today we friars still hold this creative tension within ourselves as we seek both to surround our ministry with the spirit of prayer and devotion, and to bring our ministry and all of our actions into our prayer.